Located in Richardson Ridge on a fully hedged premium lot w/lovely interlock driveway & walkway. Quality home built by Uniform w/stunning features & hwd floors on 1st and 2nd levels. Ceramic tile in all baths & foyer. Excellent layout with M/L office & formal LR & DR. Convenient powder rm & mudrm are ideal for families. Extraordinary windows throughout home allow for abundance of natural light. Gourmet kitchen has latest design cabinets, quartz counters, tile backsplash & spacious eating area. Exceptional great room has modern fireplace & 2 storey wall of windows. Magnificent hwd staircase leads to 2/L & has fabulous overview of great room. 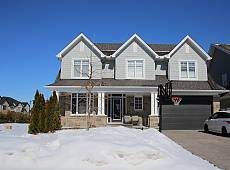 Gorgeous master bedrm has large WIC & ensuite w/granite counters.